For as long as I can remember, I have always had a problem with sweating excessively. Maybe its in my genetics, or maybe its because that's just how I "show" that I am hot...but either way, I sweat ALOT. I have read over the years that sometimes your body gets "immune" to deodorant, or even perfume, which is why it is recommended to try new things and new scents to overpower your natural "musk". Which is why I was very excited to try out Dry Idea's new Roll-On Powder Fresh 24 HR Antiperspirant and Deodorant. Unlike most products, this one contains no water - allowing a drier application. With it silicone-based foundation - that is their "secret" to allow you to stay dry all day. What I really like about this Roll-On deodorant, is that is really gave me ALL day protection from being out in this crazy 100 degree Missouri weather we have been having. Dry Idea allowed me to have little to no odor, and gave me the comfort of having an deodorant that didn't smell like a gym locker. The product is hypo-allergenic and it even contains Vitamin E.
After trying this product out consistently for more than a week, I can honestly say that I am really glad that I switched. With it's long lasting protection, I feel great and confident being around my family and friends - even outdoors! Dry Idea is holding a Sweepstakes with $1000 in prizes! There is a $500 1st place prize and 10 $50 2nd place prizes! Be sure to CLICK HERE to enter, so you can WIN! To learn more about Dry Idea, you can visit their website and like them on Facebook as well. 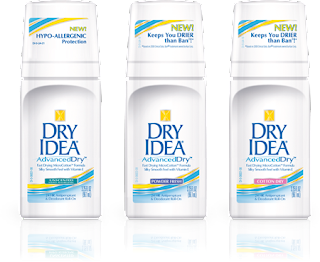 I would like to giveaway THREE Dry Idea deodorant coupons - good for 1 FREE 3.25oz or smaller Dry Idea AdvancedDry deodorant to THREE of my readers. To enter, simply fill out the Rafflecopter form below. This giveaway will end Sunday, July 8th and the winners will be announced Monday, July 9th! Good Luck! 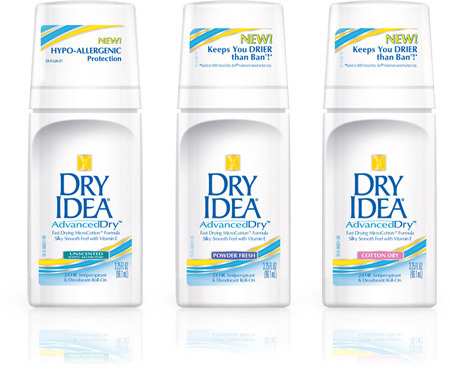 I received a free sample of Dry Idea Advanced Dry Roll-On deodorant for this review from Purex Insiders. My participation is voluntary and my opinions, as always, are my own.